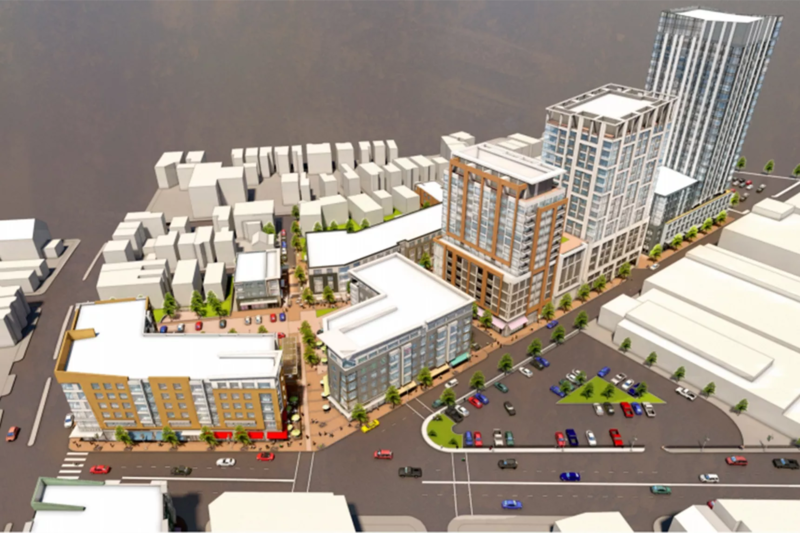 The Boston Redevelopment Authority on Thursday August 11th approved a massive new development in South Boston’s Andrew Square called Washington Village. First proposed in the spring of 2015, the nearly five-acre project is set to include 656 apartments and condos, including 110 marketed as affordable; 98,600 square feet of retail, including (hopefully) a grocery store; 440 below-ground parking spaces and 120 surface parking spots; and 42,500 square feet of open space as well as new streets, walkways, and plazas. The nine buildings of Washington Village, some of which could rise as high as 21 stories, will replace lower-slung fare such as auto shops and laundries. Andrew Square is at the heart of a planning study the BRA has been working on for a year along Dorchester Avenue in South Boston. The agency issued a draft version in June that would rezone now-industrial blocks north of Andrew for residential and commercial buildings as high as 300 feet. It could bring 6,000 to 8,000 new units of housing along the 144-acre corridor over the next 20 years. A final version of that planning study is expected before the end of the year. As for Washington Village, construction is expected to wrap by 2021. Stay tuned.